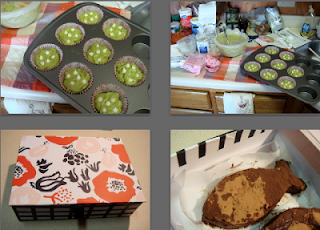 Here comes my Valentine's Day ritual...yup green tea cupcake-making! This morning, I had mil de cosas hacer, like reading four chapters for the evening class, preparing for tomorrow's class, typing up my thoughts for the group project, etc., and I had to do all that before 1pm. I tried to ignore that it's Valentine's Day and attempted to complete the assignments but when it was past noon, I put the books down and shut off my computer. Forget it. It's Valentine's Day for god's sake! I couldn't resist it any longer. I dug out the recipe I used from last year and started cooking. It took only 30 minutes or so for the entire process. I only managed to make 8 of them though. 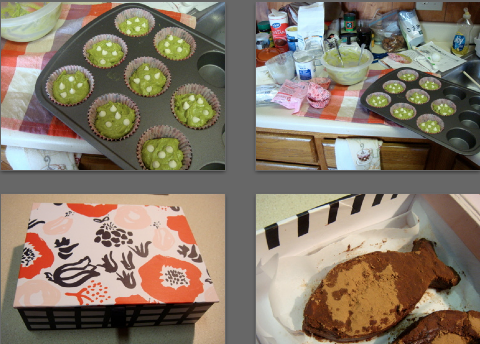 I ate two (yeah I had to taste two of them to examine carefully if they're edible, right?) and gave the rest to my friends. Hope everyone has had a happy Valentine's day today!